The United Arab Emirates, one of the world's most arid countries, is striving to capture every drop of rain it can wring from the clouds that pass over the desert nation. 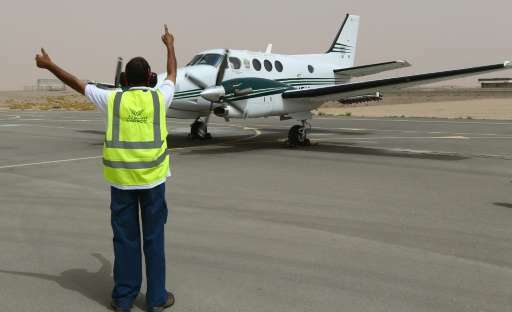 In the blazing sunshine at Al-Ain airport, a twin-propeller Beechcraft stands ready to fly into action at a moment's notice on a cloud-seeding mission. The plane is armed with salt flares that are fired into a promising cloud to increase condensation and hopefully trigger a downpour. The UAE, an oil-rich federation of about eight million people, ranks among the world's top 10 driest countries. Its annual rainfall stands at 78 millimetres (three inches), more than 15 times less than what falls in an average year in the United Kingdom. 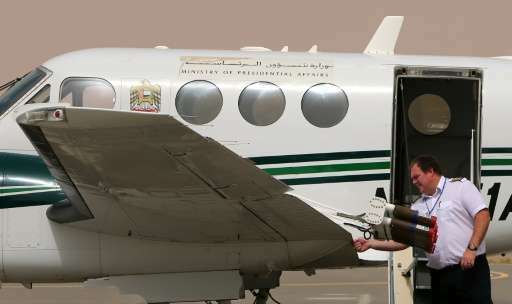 The UAE's National Centre of Meteorology and Seismology (NCMS) runs the so-called cloud seeding programme. Its Abu Dhabi-based forecasters monitor weather radars to tell pilots when to take off on rainfall-inducing sorties. "As soon as they see some convective cloud formations, they launch us on a flight to investigate" to try "to seed the cloud", said Mark Newman, deputy chief pilot at NCMS. Speaking at the base for a fleet of four Beechcraft King Air C90 aircraft, Newman said summer is usually the busiest season. That is when clouds form over the eastern Al-Hajar mountains which deflect the warm wind blowing from the Gulf of Oman. The strength of the updraft determines the number of flares fired as the plane explores the base of the forming cloud. "If we've got a mild updraft, we usually burn one or two flares. If we've got a good updraft, we burn four, sometimes six flares into the cloud," he said. Not all seeded clouds produce rainfall, but it happens often, said Newman. "It is fantastic... As soon as there is rain, there is a lot of excitement. We can hear the guys in the office are happy," he said. The effectiveness of cloud-seeding in increasing rainfall has often been questioned. However, US ski resorts in Colorado reportedly use the method to induce heavier snowfall. China also used rain dispersal technology to ensure dry weather during the opening of the 2008 Beijing Olympics. To cover its surging water needs, driven by rapid economic growth and a large influx of foreigners, the UAE has resorted mainly to desalination. The Gulf country accounts for 14 percent of the world's desalinated water and is the second largest producer after neighbouring Saudi Arabia. The country has 33 desalination plants that provided 42 percent of its needs, according to a 2013 report by the environment and water ministry. But groundwater represents 44 percent of used water, putting immense pressure on the country's reserves. Another 14 percent of water usage comes from treated wastewater, mostly for irrigation and and landscaped green areas. Rain triggered through cloud seeding is much cheaper than desalinated water, according to Omar al-Yazeedi, head of research at NCMS. In 2010, four days of heavy rain induced by cloud seeding brought downpours equivalent to the nine-year output of a single desalination plant in Abu Dhabi, he said. "This shows that there is a huge amount of water that could be tapped... It is a source that can not be ignored," he said. Studies show that cloud seeding can increase the amount of rain by between five and 70 percent, depending on the quality of the clouds, he said. The American Meteorological Society said in 2010 that despite some uncertainty over its effectiveness, "large potential benefits can warrant relatively small investments to conduct operational cloud seeding". The UAE is also looking into methods to preserve the rain that does hit the ground, instead of allowing it to quickly evaporate or flow off into the sea. It has built dams and reservoirs to gather water that flood desert wadis. The country has around 130 dams and levees with a storage capacity of about 120 million cubic metres (more than four billion cubic feet), according to the ministry report. NCMS executive director Abdulla al-Mandoos said studies were being prepared to plan more dams and to protect water, aimed at directing rain "from the cloud right into the aquifer". "We do not want to waste a drop of water," he said.